If you know me at all, you're probably aware of my fondness for tiny things. For as long as I can remember, I've liked anything little. This week I've had the pleasure of making these itty-bitty gifts for a party that a very special client of mine is hosting. We're creating a long floral tablescape on a table set for 20 guests. These tiny gifts will be tucked into the display along with some small birds. I can hardly wait to put it all together. The goal is to create a display with lots of little surprises for the guests to discover during their dinner. 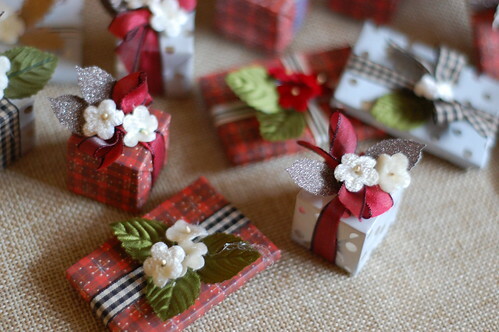 Below is a little peek at the tiny gifts. I'll be taking lots of pictures of the whole display, and share will them after the event. 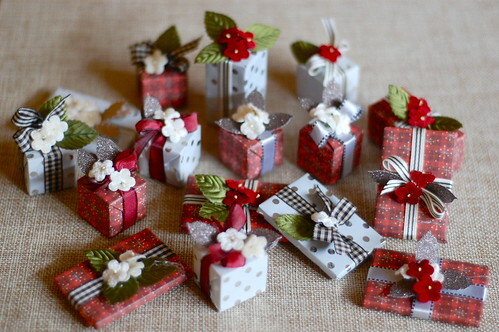 I have to say, wrapping these tiny gifts was just about the most fun I've had all year. These are darling...but look like they may be a little hard to wrap at least for me that is!! Can't wait to see the photos of the table display!! These are too sweet! I love the little flower accents.